Chocolate Peanut Butter Pumpkins. A scarily good Halloween treat, dark chocolate pumpkin shells filled with salty and sweet peanut butter. Who’s excited for Halloween? I know I am because it just so happens to be my beautiful boyfriends birthday which means I get to plan a delicious 3 course meal for two, yay! I’m thinking a posh prawn cocktail (Nathan’s favourite) with big juicy prawns followed by steak (I haven’t decided what with yet) and of course CAKE! So because we are too busy celebrating Nathan’s birthday on the 31st of October we have run up Halloween celebrations the week before instead. This includes, pumpkin carving, watching Halloween movies which btw are NOT scary in the slightest although I used to love scary movies when I was younger I just CANNOT DEAL anymore, no way. I’m thinking Hocus Pocus and The Nightmare Before Christmas (which I also kinda like to watch at Christmas). Scary cocktail making (it’s so fun being an adult 🙂 ) and consuming lots of Halloween treats such as these scarily good, Chocolate Peanut Butter Pumpkins. *This post contains affiliate links which means if you purchase a product through those links I receive a very small commission which helps my little blog grow. These chocolate peanut butter pumpkins are so simple to make it couldn’t be easier. I fill these cute little moulds with chocolate then place them in the freezer to set. Meanwhile I mix smooth peanut butter and icing sugar together with a pinch of smoked sea salt. I always make peanut butter myself because it tastes amazing and is 100% peanuts, yup nothing else goes into it and it only takes 5 minutes to make. I simply blitz peanuts in a food processor for 5-8 minutes until it’s smooth and delicious. You’ll see the peanuts going through different stages from peanut crumbs to a dough like ball until it finally turns silky smooth. I then fill the moulds with the peanut butter mixture and place them back in the freezer for 15 minutes before spooning over more chocolate. After another small wait in the freezer these little scary treats are ready to be munched upon. P.S If you love Halloween treats be sure to check out these spooky Halloween Brownies they’re super easy and look like so much fun to make! Place a pot on a low/medium heat and fill it half way with water. Place a heatproof bowl on top, making sure that the bowl doesn't touch the water (remove some water if necessary). Place 150g of the chocolate in the bowl, stirring occasionally until melted. Remove from the heat. 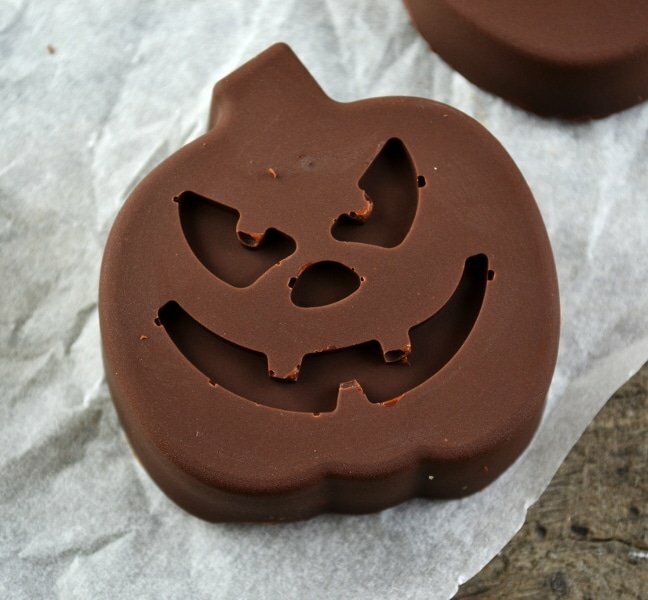 Spoon equal amounts of the chocolate into the pumpkin moulds (around 1 tbsp per mould). Draw the chocolate up the sides of the moulds with the back of the spoon. Place the moulds in the freezer for 15 minutes. Meanwhile mix the peanut butter, icing sugar and salt together until smooth. After 15 minutes remove the moulds from the freezer and spoon 1 tsp of peanut butter into each pumpkin. Smooth the peanut butter mixture out as smooth as possible then place back in the freezer for another 15 minutes. Meanwhile melt the other 150g of chocolate the same way as before. After 15 minutes spoon equal amounts into each mould, tap the moulds on the counter top so they are level then place back in the freezer for another 15 minutes until set. Enjoy straight away or at room temperature. Can be stored in the fridge for up to 5 days. Ha that’s so funny, great minds think alike! What a cute idea, I know these will taste amazing! Oh WOW! I adore these! 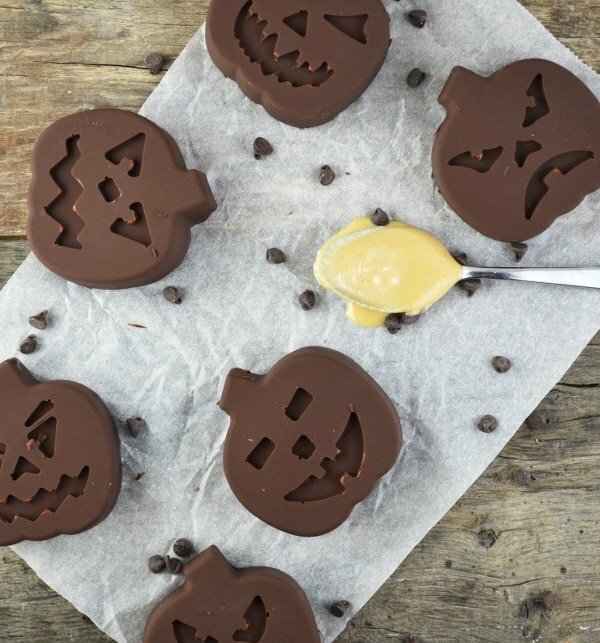 They are so adorable – [eanut butter cups made perfect for Halloween! 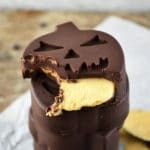 I love these – peanut butter filled chocolate treats are always the best, and these are even better for being seasonal. looks like perfect Halloween treat, enjoy! Oh my! These are absolutely adorable…and look so tasty! What a perfect treat for this weekend! What a cool idea! Was carving the faces hard? Saving this for later. Thanks Amanda, haha no it wasn’t hard I used a pumpkin muffin mould to make these. Love these! They are too cute and sound amazing. Definitely need to check out that mold. These are so cute, and perfect for a Halloween party! I love the combo of chocolate and peanut butter! What a fun Halloween treat! They sound so delicious too – I really like the idea of adding the smoked sea salt to the filling. Those moulds are fantastic! Thank you so much April! I love using smoked sea salt it gives food such a lovely flavour. I LOVE these Halloween treats! My kids would love making them, too. Thanks for the great idea. Aw thank you so much, enjoy! !